10+ Seeds. 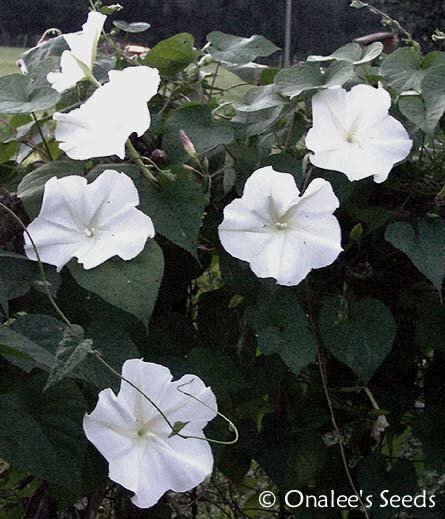 The wonderful fragrance of the 6 Moonflowers makes it a perfect flower for growing on a trellis near your bedroom window or deck where you can enjoy them all night long! You?ll love watching the ?hummingbird moths? zipping from flower to flower! 10+ Moonflower vine (Ipomoea alba) seeds which have been tested for germination. Planting instructions, including a color photo of a seedling for id, are included. This close relative of the morning glory has similar heart shaped leaves that are a rich green and 4 to 6 inches long. They provide a beautiful backdrop for the spectacular, fragrant moonflowers. This vine could just as well be called the evening glory as its buds open in late afternoon and last only until morning's light. Moonflowers make up for the short duration of individual flowers by producing lots of large (5-6 across) blossoms throughout the summer. These are held on a stem that bears several buds simultaneously, not all of which bloom the same night. The long 4 buds are also very attractive, especially in the hours just before the flower un-furls. These make an EXCELLENT accompaniment to your Morning Glories!! I grow mine side by side on my fence, letting them intertwine, so I have blooms from my morning glories in the morning and my Moonflowers in the afternoon and evenings! 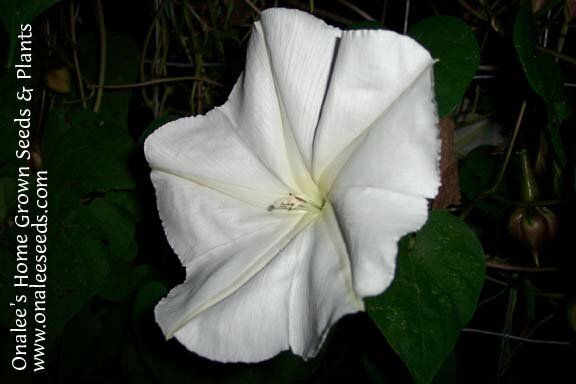 The wonderful fragrance of the Moonflowers makes it a perfect flower for growing on a trellis near your bedroom window or on the railings of your porch or deck where you can enjoy them all night long! 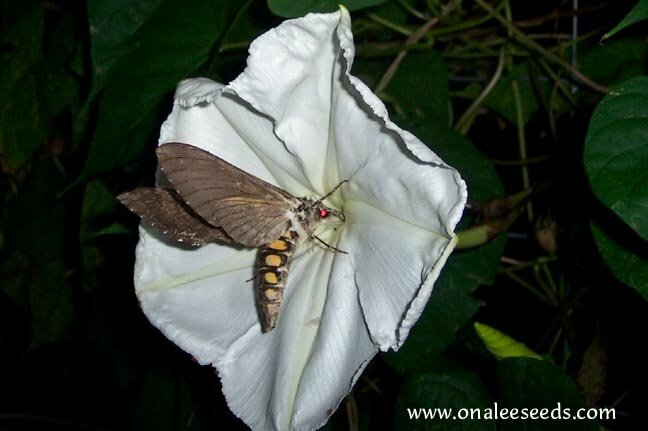 You?ll love watching the hummingbird and hawk moths (Sphinx Moths) as they hover in and out of the large white flowers each evening collecting their nectar and pollinating your flowers! Moonflowers grow well in average soil in temperatures averaging 70-90 degrees with full sun or, in very hot zones, partial shade. Moonflowers grow as an ANNUAL (ZONES 4-9) in most areas, but PERENNIAL (ZONES 10+) in warmer climates. Can be grown in zones 4-11.